Some folks who want to get their garden area set up quickly 'n easily may find that raised garden beds are a better choice for them rather than setting up or putting in inground garden beds. Rather than doing all that digging, or waiting for an undug bed to ready itself, some folks prefer setting up the framework for a raised bed in order to hold in the soil for their garden area. You can use practically any type of material as a framework for the bed ... wood boards, bricks, stones, logs, cinder block, etc. Raised garden beds typically use less space. The beds have better drainage. 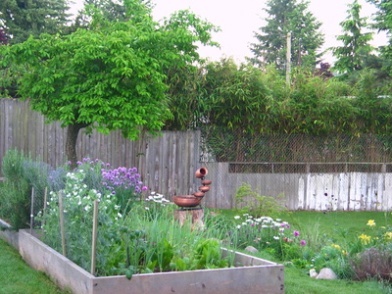 Most raised beds are easier to maintain than in-ground garden beds. You'll want to use material that will stack easily anywhere from 8-12in high. If you use wood, redwood or cedar is best. You'll want to avoid chemically treated woods such as railroad ties as these may allow chemicals to seep into the soil. If you use stones, you'll need to stack them together tightly or cement them together. You'll want the soil to remain in the raised bed when it rains or when you water rather than allowing the soil to escape and run out through any gaps in the stones. Purchased topsoil and compost can help easily create a perfect planting medium in a raised bed. If you're placing a raised bed on sand, the soil may tend to wash out so you'll want to line the bottom of the bed with landscape fabric to help hold in the soil. If you're interested in raised bed gardening, you might also check out some of the raised bed kits that are available now. Their are a wide variety of kits available in different shapes and mediums. Some frames have edges that serve as comfy seating from which you can sit back and enjoy the beauty of your garden areas.